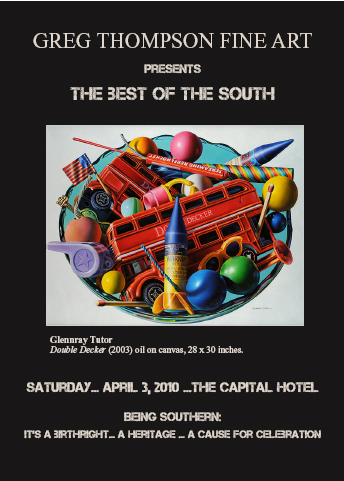 Greg Thompson Fine Art is pleased to join with the Oxford American Magazine during their Best of the South Awards Gala on April 3, 2010 at the Capital Hotel. This wonderful gala will honor Morgan Freeman and Charles Portis. Greg Thompson Fine Art will have 16 works of art on display during the event that highlight and showcase some of the best artists in the South, including Donald Roller Wilson, Glennray Tutor, William Dunlap, Caroll Cloar, and others. For more information on the event, call the Oxford American at (501) 320-5730. If you cannot make the event, but are interested in seeing the work displayed at the event, please call us at (501) 664-2787 and arrange for a private viewing.